Why would I need self storage in Frederick, MD? There are a variety of reasons why you might need self-storage in Frederick, MD. How much is a storage unit in Frederick, MD? The cheapest storage unit in Frederick, MD is $45.00 per month. What size storage units do you have available in Frederick, MD? In Frederick, MD we have sizes that range from 5'x6' to 10'x30' to suit your storage needs. How much is it for a 5'x6' storage unit in Frederick, MD? The cheapest 5'x6' storage unit in Frederick, MD is $45.00 per month. Frederick is a bustling city in Frederick County, Maryland, located about 50 miles west of Baltimore and 50 miles northwest of Washington, D.C. Originally called Fredericktown, it is believed to have been named after Frederick Calvert, the sixth and final Lord Baltimore. It's one of Maryland's largest cities, with a storied history that dates back to the nation's early years. 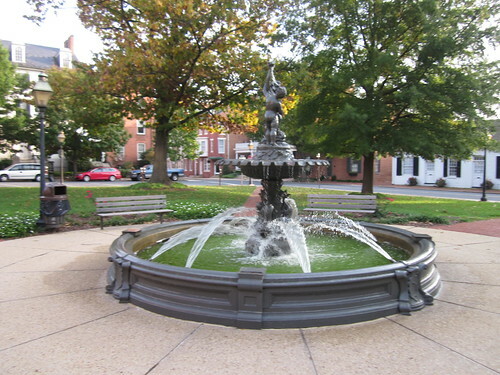 Frederick's historical downtown region has numerous museums, stores and restaurants. It's a popular weekend spot for locals and visitors alike, offering many unique places to catch your interest. If you'd rather take a day trip to one of the big cities in the area, major highways and U.S. routes make it easy to access Baltimore, Washington, D.C., and other nearby communities. Annual events like the Summer Concert Series, the Frederick's 4th celebrations for Independence Day and the Festival of Lights add to Frederick's character and provide plenty of opportunity to get to know your neighbors. Frederick lies within one of the country's largest bioscience clusters, creating a science-focused local economy and workforce. The work of key organizations like Fort Detrick and the Frederick National Laboratory is complemented by more than 80 local bioscience companies. Another powerful economic force in Frederick lies within its downtown area, with its many business establishments fueling the city's economy and providing jobs. Many businesses are attracted to Frederick for its excellent transport infrastructure and highly educated population. Frederick has been ranked as one of the smartest cities in the United States, with a significant percentage of locals holding a bachelor's or graduate degree. The community is well-known for its distinctive architecture, which features a skyline made up of the spires of many historical churches. Many of Frederick's homes are from the 19th and 20th centuries, built in the historical row house style. Frederick is home to a vibrant arts and culture scene that nurtures music, theater and visual arts. Downtown Frederick alone hosts more than 10 art galleries, and three theaters can be found within steps of each other (the Cultural Arts Center, Weinberg Center for the Arts and the Maryland Ensemble Theatre). The Francis Scott Key Hotel is home to the Maryland Ensemble Theater, a local theater company that dates back to the mid-1990s. The Frederick Symphony Orchestra performs several classical concerts a year, and you can also attend performances by the Frederick Chorale, the Frederick Regional Youth Orchestra and more. Baker Park is host to twice-monthly recitals (every first and third Sunday), which have become a local tradition. Dance is also a large part of the Fredrick arts community, with more than 30 studios scattered across the city and the annual DanceFest event. Frederick County Public Schools operates the public schools in Frederick, earning national attention for its extremely high graduation rate and excellent academic performance. There are also several private schools in the city, serving grades K through 12. Frederick also offers higher education within its city limits, with a variety of degree programs offered at Frederick Community College, Hood College and Mount St. Mary's University. Utilities: The county oversees the water and sewer services in Frederick and its neighboring communities. Potomac Edison is the area's major energy provider. Garbage and Recycling: You can expect your trash to be collected on a weekly basis. Transportation: The MARC commuter rail and TransIT network both provide public transportation options in Frederick. It's also an award-winning bicycle-friendly community. Although Frederick's housing prices are on the rise, it still remains fairly affordable when compared to the Washington D.C. metropolitan average. There are plenty of rental options as well, making it easy to find something that fits your lifestyle and budget. Our lowest priced units in Frederick, MD average $87.33 per month. 139 people have reserved units in Frederick, MD in the past 30 days. There are 3 locations within Frederick, MD's city limits. There are 2 locations in Frederick, MD that offer AC and Heating features.